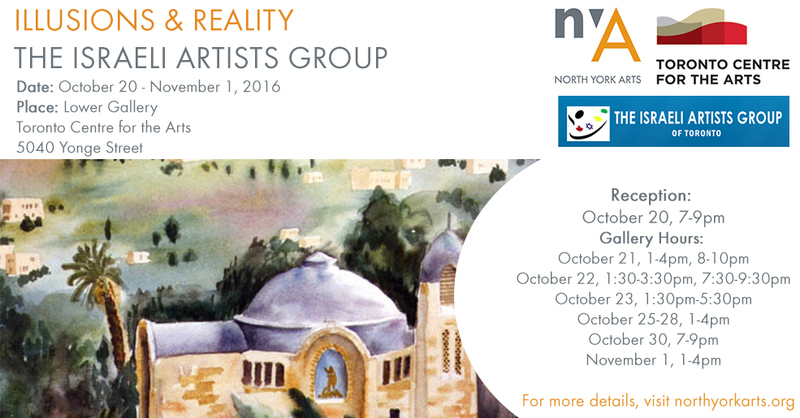 The Israeli Artists Group of Toronto was established in 1992 by a small group of Israeli artists. It is comprised of visual and applied artists who work in a variety of media, such as: painting, sculpture, ceramics, textiles, calligraphy, photography and jewelry. The Israeli Artists Group is a non-profit organization and all the positions are held by volunteers. Over the years, the members have developed bonds of friendship and provided each other with inspiration, mutual support, and an exchange of artistic knowledge. Some of the artists in the group are recent immigrants to Canada. Being in our group assists them to acclimatize to the competitive arts community of Toronto. Join us for a reception on October 20th, from 7-9pm!